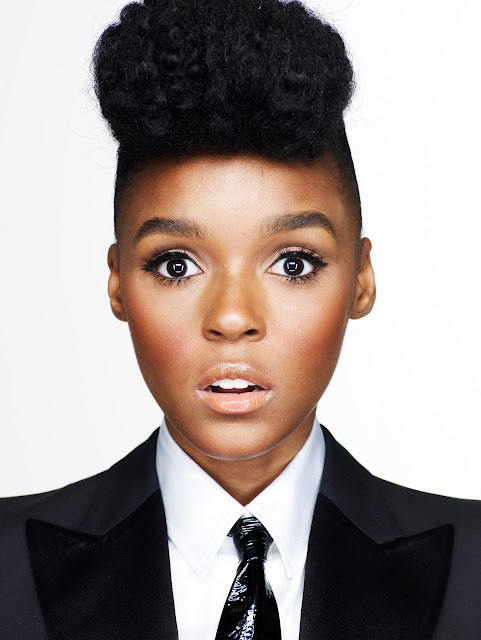 To say Janelle Monáe is unique is an understatement – a severe understatement. While many other artists may only excel in one skill – be it as a songwriter, a singer or a dancer – Monáe tackles this trifecta with a confidence and a seemingly effortless ability to amaze. But none of this is a surprise once you learn the Grammy Award-nominated performer's backstory. Originally from Kansas City, Monáe's childhood was disrupted by the rough reality of a father with a damaging drug addiction. This caused the young girl to turn inward, creating her own world through her imagination – a skill she transformed into an anchor for her creative outlets later in life. Monáe later discovered her penchant for music and the arts and soon found herself attending New York's American Academy of Dramatic Arts in hopes of pursuing an acting career. After becoming frustrated by the audition scene in New York City, however, she booked a flight to The Netherlands on a whim. But she never got there. Laid over in Atlanta, Monáe felt a strong draw to the city's musical movement – after all, it is the home to Outkast and many other groundbreaking hip hop and R&B artists – and she decided to stay. Her first musical foray in the ATL was to team-up with producer/songwriters Chuck Lightning and Nate "Rocket" Wonder. The three then formed The Wondaland Arts Society, which served as a musical collective, studio and Monáe's studio. By chance, Monáe met Outkast's Big Boi at a local music event. Big Boi took to the soulful songstress and she earned her place on his “Got Purp? Vol. II” mixtape and on two songs on Outkast's musical film soundtrack for Idlewood. The two later collaborated on Monáe's catchy, quick and uptempo single "Tightrope." Then, Diddy contacted her – believe it or not – via MySpace. Sure that it was a joke, she ignored his messages until Big Boi confirmed it was indeed the head of Bad Boy Records. Late in 2008, she was signed to the label and an amplified version of her debut album, Metropolis: The Chase Suite (Special Edition), was released. While her musical catalog to date is slim, it's very strong – strong enough, in fact, to earn her a Grammy nomination last year for Best Urban/Alternative Performance for her single "Many Moons." The Metropolis concept project – the first in a four album story detailing the life of a soul-equipped android on the run facing the possibility of being turned into scrap for falling in love with a human – is an album that explores love, loneliness, different social classes and even slavery. "Many Moons," like many of the songs on the album, is a fast-paced track that draws on elements of funk, hip hop and soul. Its lyrics speak of fear and what lies around the corner in an unknown world where your differences from others make you a despised and hunted target. Though spoken through the words of the android, the song resonates in truth and history. Monáe's striking voice delivers these lyrics of heartbreak and fleeting hope in a powerful, almost playful cadence. One example of her extensive vocal versatility is "Sincerely Jane," where she bounces between short lyrical busts and ballad-esque choruses. And on "Violet Stars Happy Hunting!," she demonstrates an almost screaming style of singing that exposes the inner passion behind her work. Stationary isn't a word you would use to describe Ms. Monáe. From her videos to live shows, she moves almost non-stop in quick steps, using the full space of the stage she's given. Matching the song's sharp beats with abrupt movements, often in an implied android-like fashion, her stage show is akin to a high cardio workout routine. 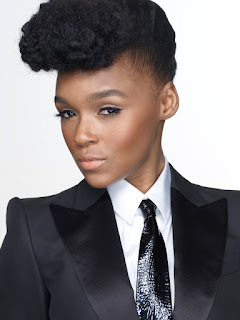 That said, Monáe is capable of slowing down to offer the thoughtful lyrics their due place and focus. Visually, her style also stands out. Usually dressed in crisp, contrasting outfits, such as black and white exaggerated and augmented pant suits or dresses, her unique wardrobe choices also add an element of mystique. With the combination of talent, drive and imagination she possesses and shares through her music, we may not be able to and shouldn't attempt to predict Janelle Monáe's next move or musical direction. We can only be sure that it will be unique in depth and intricacy. Artists like Monáe are few and far between, often shuttered under the saturation of copycats clogging the airwaves and pop culture. Those who reach out and embrace her abstract style and addictive, soul-filled sound won't be disappointed. 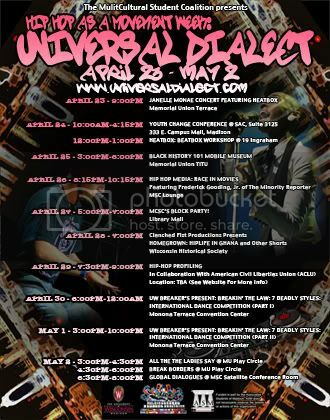 Janelle Monáe performs at the Memorial Union Terrace on Friday, April 23, at 8pm. Information for this feature was obtained from Monáe's website, www.jmonae.com, which also presents audio, video and updates about the artist.